So it’s been a while since I posted. Why is that, well because I’ve had a complication from my surgery which was five weeks ago. By week three post surgery I was pretty much back to normal. Then out of nowhere I was in such extreme pain I curled up in the fetal position on the floor putting the boys to bed one night. Needless to say the pain didn’t go away as I was hoping. On the fourth day I went to the doctor. Long story short I was healing wonderfully but was suffering a diverticulitis flare up. So anyway, I went on a short liquid diet and now am on a low residue diet. This is extremely difficult for me as I am craving my usual fruits and vegetables which are now verboten. I am stumped every day as to what to eat. I can’t have what I want. I haven’t been cooking like usual lately, thus no blog posts. Then yesterday I was so over it. I decided to bake some muffins, them I could have. Of course there was the problem of no nuts, seeds, fruit other than banana and no whole wheat flour. I first wanted chocolate orange muffins, but if I couldn’t have coconut then my orange coconut chocolate chip mini muffins were out. These muffins are what I came up with, something to satisfy the cravings that I was allowed to eat. They didn’t give me any pains so it was declared a success! The boys also declared it a success! 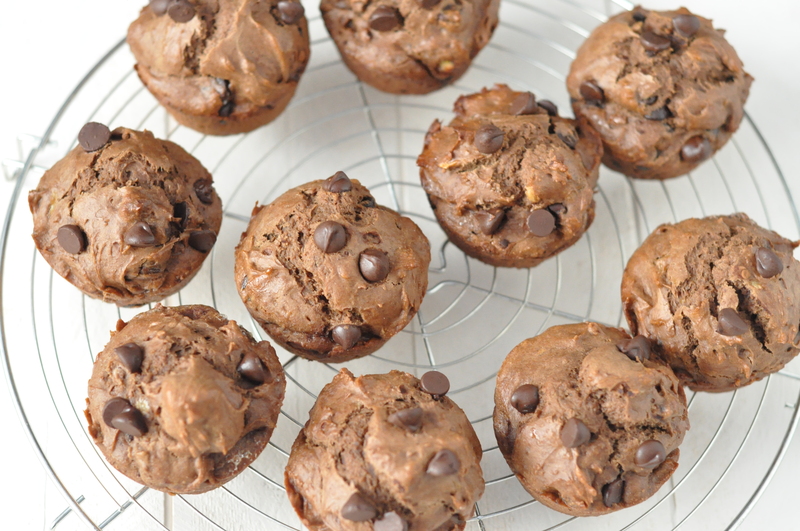 The cocoa powder gives them a nice rich chocolate flavor which is only improved with dark chocolate chips. Peanut butter is the source of fat and the single banana gives it a little more moisture and flavor. 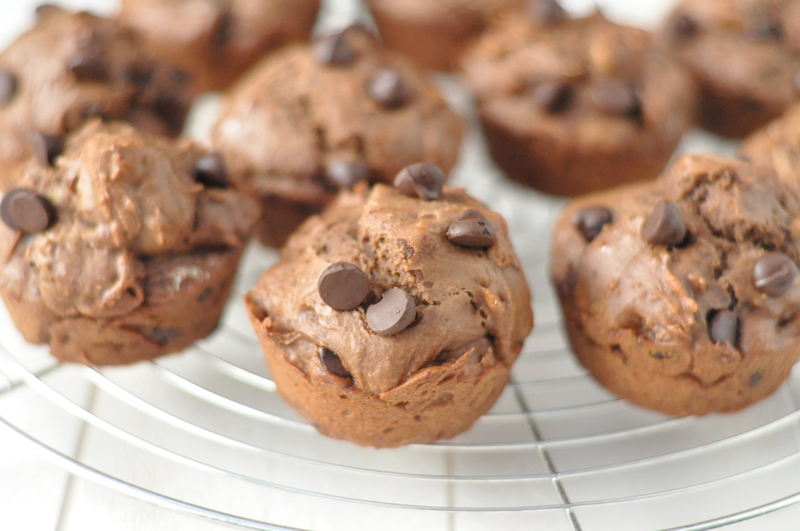 They are a little on the dense side, definitely a muffin to fill you up in the morning. Preheat the oven to 375 degrees and line a muffin tin with papers or cooking spray. In a medium bowl sift together the flour, cocoa powder, baking powder and salt. In a small bowl mix together the peanut butter and banana until well combined. Add the brown sugar and mix well. Stir in the eggs, vanilla and milk until well combined. Pour the wet ingredients over the dry and stir until just combined, do not overmix. Fold in the chocolate chips and pour into the prepared pan. Bake for 20-22 minutes. 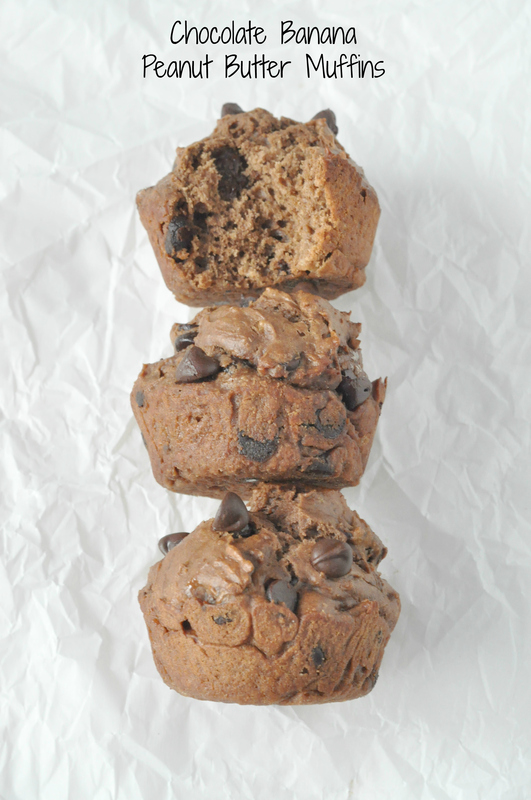 This entry was posted in Muffins and Quick Breads and tagged breakfast, brunch, diverticulitis, easy, kid friendly, low residue diet, muffins on March 26, 2015 by Gretchen. Hope you’re feeling like much better real soon! Thanks! I am indeed finally feeling better end enjoying my regular foods again. Gosh, poor you. It sounds awful 😦 I hope things get better soon. These muffins look really good, and well done you for being so inventive! Thanks! Finally feeling better and getting back to regular food, just in time for all the Easter goodies. Thanks Liz! I am finally doing better and eating my favorite foods! They hit the spot! Luckily I am now finally able to enjoy my usual foods again, bring on the fruits and veg! Gretchen, I was so worried about you and couldn’t find your email!!!! I am so glad you are okay. Those muffins look amazing. Might try with a GF flour blend. Look at that height and fluffiness! 🙂 I love that you combined banana and chocolate. Will report back after making! I had some kidney issues and a virus, which reminded me that you’d been sick, which led me to your blog (and muffins!). Please take care of yourself! I am feeling fine now, thanks Shanna. How are you? Nothing quite like being sick and still have three little ones to take care of. I am looking forward to cooking and baking again now that spring break is over, travel done and we are back to a normal albeit crazy busy schedule. I just was reading about a banana, peanut butter and chocolate cookie recipe, this seems to be a winning combination. I bet the boys really enjoyed the muffins. I will have to look into those cookies! Thanks! We had a wonderful Easter, thanks Michael. I also love banana cake with peanut butter frosting between the layers and covered in chocolate ganache!